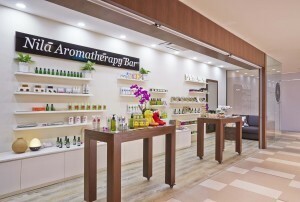 Nila Aromatherapy Bar (Shaw Centre) offers a one-stop shopping experience for essential and base oils and aromatherapy accessories, as well as Nila’s own line of body, skin and hair care products. Essential oils are one of nature’s best-kept secrets valued for their therapeutic properties that smell wonderful and supports and enhance our natural wellbeing. They are highly concentrated aromatic substances found in the glandular cells of plants and flowers. Commonly used for immune support, stress relief, relaxation, skin care, hair care, respiratory health, sleep enhancement, muscle tension and pain, mood enhancement and emotional balance. We also offer one-of-a-kind bespoke aromatherapy experience, where a custom blend can be created according to your specific needs. If you are new to essential oils, you might want to check out our range of signature blends first. Some of our best-selling signature scents includes the INSOMNIA, BELIEVE, BREATHE-EASY, STRESS AWAY, ANTI FLU, and ANTI-BACTERIA blends. The use of essential oils for therapeutic purposes requires education and knowledge. We believe in ensuring our customers' safety and wellbeing by providing information and conducting workshops that can help prevent the misuse of oils, and enhance their benefits. Experiencing the goodness of aromatherapy, Adeline wants to share with you the therapeutic benefits of quality essential oils. With this goal, thorough studies was done of essential oils, gaining mastery in the subject and bringing the therapeutic properties of essential oils into every home for everyone to enjoy and benefit. With her vision and knowledge, Nila was started in 2013 with signature blends personally concocted by Adeline. These well-received star products provided the foundation for Nila to grow into a respected local brand which continues to innovate and live up to its brand promise of using no parabens, free of harmful chemicals, chemical fragrance, and artificial colours. Founder of Nila, Ms. Adeline Lim grew up in a kampong amidst plants and nature, plucking fruits and climbing trees. These fueled her connection with nature and her appreciation of natural elements. This upbringing stirred her desire to use natural, protective and healing properties of essential oils for her family‘s well-being. Experiencing the goodness of essential oils, she wants to share with others so that more people can reap the therapeutic bene ts of quality essential oils. With this goal, she embarks on thorough studies of essential oils, gaining mastery in the subject and bringing the therapeutic properties of essential oils into every home for everyone to enjoy and benefit. With her vision and knowledge, Nila was started in 2013 with signature blends personally concocted by Adeline. These well-received star products provided the foundations for Nila to grow into a respected local brand which continues to innovate and live up to its brand promise of using no parabens, free of harmful chemicals, chemical fragrance, and artificial colors. With Nila’s products, you and your family are in safe hands. To ensure that her customers are provided with the best for their personal well-being, Adeline completed her diplomas in Aromatherapy and Holistic Skincare Products at The School of Natural Health Science in the United Kingdom. All courses by the School of Natural Health Science are accredited by The International College of Holistic Medicine (ICHM). She also completed an advanced certificate seminar on Essential Oil Chemistry and Pharmacology with renowned Robert Tisserand. Finished my first bottle of Hair Tonic and feel really comfortable using it, saw results with baby hairs within weeks. Tried other hair tonics before which apparently caused irritation and not many results. Thank you v much! Service is superb! A place you must return again and again esp. for aromatherapy enthusiasts or someone looking for more natural products. Excellent product. We used argan oil on my mom who has very dry skin, her skin condition improves tremendously and the dark spot on the skin become less. My mom also suffers from bed sores and the oil helps in moisturizing her skin. Her skin is shinier and smoother. Thumbs up for Argan Bio Oil. I switched over to their products this year and noticed a great difference. I suffer from dry but oily skin that was getting worse due to daily use of makeup. I use their Argan Bio Oil as a body and face moisturizer – within a few days of switching my skin was less dry and taut, my complexion evened out and looked glowing, and it was a great makeup base that made application smooth and my makeup lasted throughout the day without the need for frequent touchup. Before, I used an expensive French moisturizer that always left my skin dry unless I applied it, now my skin is hydrated throughout. I had a severe oil control problem that’s improved a lot since I switched. On the whole, quality and unfussy products. Appreciate the lack of chemicals and straightforward ingredients. Great quality. My 1st purchase with NILA is theirNila Natural Mosquito Repellant - Snap Shot Mosquito Repellant. Our family is going to Taiwan for holidays and everyone is telling us to bring mosquito repellant because there are a lot of mosquitos. I never like to buy the mosquito patch because the smell stink & I can’t find any effective & yet natural mosquito repellant. Few days before my trip, I visited the Artisan and Farmers Market. My girlfriend recommended me the mosquito repellant. I purchased both the adult & kid. My family & children will apply them every day before we go out for an outing. Not only effective, we love the smell and it helps to moisture our skin too! Awesome products!!! First-time visit this shop yesterday very happy that the salesgal explain to use very clearly will go again and only stick to this brand. I have been using Nila’s hair tonic for the last 5 months. Not only has it helped my hair grow more quickly, it is also denser / thicker and a lot softer, making it easier to manage. I use this in conjunction with Nila’s anti-hair loss shampoo which definitely has helped my premature hair loss woes. The products have the added benefit of being all natural! Absolutely awesome, thanks! Happened to chance upon this small cozy shop at Shaw center & bought a few of their blends to try out. Especially love this particular oil, Happy Feet which help to relieve my super aching legs after a whole day of shopping. Highly recommended! I don't always develop likes that easily for things in general but Nila caught my attention by accident! Eversince I started using the Essential Oils I got from Nila - thanks for the passion of Adeline (the founder and originator of Nila herself) I quickly learnt a lot about the other dimensions and aspects of Aromatherapy. It is through her passion, creativity and inspiration, I'm enjoying Aromatherapy like never before. Helps me health wise (Breath Easy and Balance), whilst giving me a calming meditation effect when I wanted so. I'm starting to enjoy every day and especially night time using the Aromagems - The 7 Chakras! Big thanks to Adeline for creating something so special and unique! Just tried Nila's Nourishing Nail Oil. Amazing product. Other than dry cuticles, skin near the nails use to peel and stick out like pins and bleed. Saw result on 2nd use on the same day. Now i take it where ever i go !!!! "THUMBS UP, HIGHLY RECOMMENDED"
Nila's essential oils and mist have since been in my daily routine after my first encounter with them. Even accessories, roll ons as well as blends are amazing! Amazing shop & people! Got in love with essential oils after knowing this brand! Products are great especially hair tonic and eczema!